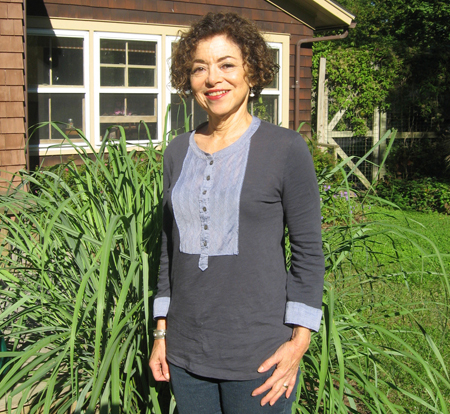 Did Lois Morris ever imagine, when she first bought a house here in 1984 — divorced, just past 40, barely employed, and knowing no one — that in 2012 she would be married, making a good living as a writer, serving as a trustee of the Shelter Island Association and the new president of the League of Women Voters? The answer is most certainly in the negative but she’s more than pleased with the turn of events. Born in Chicago, she grew up in Glen Cove, Illinois, a Chicago suburb on the shore of Lake Michigan, with an older sister and a younger brother. After high school, “My greatest desire was to get at least 1,000 miles away from home,” she said, but she had to settle for 900, attending the University of Pennsylvania in Philadelphia. After graduation, in 1965, for several years she worked in the only jobs she could find, first at “Modern Screen” magazine and then editing “Movie Stars Magazine.” But then she landed a position with Arthur Frommer, already well known for his travel books and stayed there for the next 10 years. She married during that time, in 1968. “It was the ‘60s and I was going on 25, which was really old,” she said. Both her siblings were married, “So I knew I’d better do this. I now know that is not the way to get married. I think it was the last moment when women felt there was no life without marriage.” She stayed married for eight years. But no one was sympathetic to her being bored when she had such a great job. Then when the company was bought by Simon and Schuster and her position became “a real publishing job, and very corporate,” she was even more bored but didn’t know what she wanted to do. Her mother offered to cover her rent for a year so she could find out and died soon after, leaving “a little money,” so she made the break. The following year, she took a share in a house here, with other people, all in publishing or the media. With her combined contacts, she managed to pick up enough work to make ends meet, and then met a physician, John M. Oldham M.D., who was putting a book together on psychoactive drugs and asked her for help. She went on to coauthor seven books on mental health with him and also collaborated on the award-winning “Columbia University College of Physicians & Surgeons Complete Home Guide to Mental Health.” Another collaboration followed: “The Complete Book of Cancer Diagnosis, Treatment, and Recovery,” now in its second edition, which she coauthored with Harmon Eyre, M.D. Fascinated by the health issues she’d researched and written about, she began a monthly column for Allure magazine, “Mood News,” and found herself established as a health writer, “but mostly from the neck up, writing about psychology and psychiatry and I really loved it.” That’s what she’s been doing ever since. She met Bob Lipsyte, the New York Times sportswriter and journalist, on the Island in 1998 and they married in 2004. They both work at home. “We’re in the house all day together but we’re very good at it, good at working together, respectful of work time and odd hours,” she said. In time, they began collaborating. They did a series of articles for the New York Times, in 2002, on the Perlman Music Program, traveling to China to report on the Perlman program there.They met the Chinese operatic bass Hao Jiang Tian and later worked with him on a memoir about his extraordinary life and times, “Along the Roaring River: My Wild Ride from Mao to the Met.” This led to another series of articles for the Times about the composer Tan Dun and the development of his opera, “The First Emperor,” commissioned by the Metropolitan Opera. Lois had never been active in community affairs but six years ago, when Phyllis Gates, an officer at the Shelter Island branch of the League of Women Voters, asked her to become a board member, she was reluctant. “She assured me I wouldn’t have to do much,” but she was assigned to Voters Services, which required a lot of time. “But I did it and got to meet such wonderful people,” she said. When Cathy Kenny stepped down from the presidency this year, Lois took her place. “The League is always active,” she said, “but November is the moment,” when Election Day comes around. “Our mission is to get people to vote, here or anywhere, just vote. I don’t know why, but people, even those with strong opinions, don’t think their vote matters. Shelter Island taught me that your vote matters. If everybody who says, ‘Oh, my vote doesn’t count,’ if they all voted, their votes would count. Especially in local elections, a few votes can be very important.” The League will be out and around the Island over the next few weeks and Lois will be there with them. Busy — but certainly not bored.